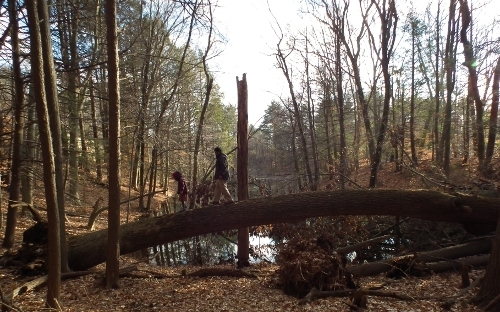 A friend came to visit us and after eating homemade Belgian waffles I suggested I take her and my family to Pod Meadow, which I had discovered on a walk with Transition earlier in the week. The weather was a balmy 55F and only partially overcast. 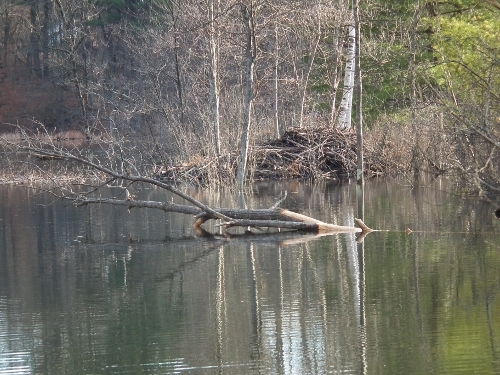 Amazing, the sudden dip toward the Pond and the lack of tangled shrubs under the stately trees – mostly beeches, oaks and some pines and spruce – which allows you to see right through. It gives the open and clear feel of a maintained forest, much like, I presume, the forests in the time of the Native Americans, who used to set fire to the underbrush to make hunting and travel easier. 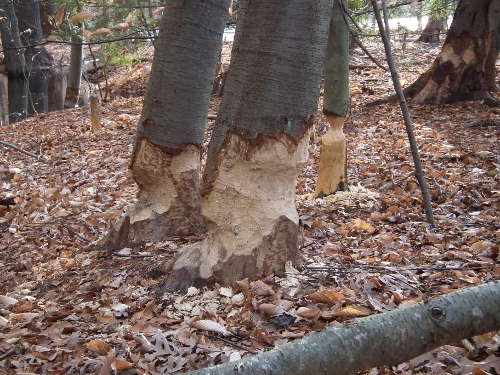 In this forest the maintenance is done by the beavers. 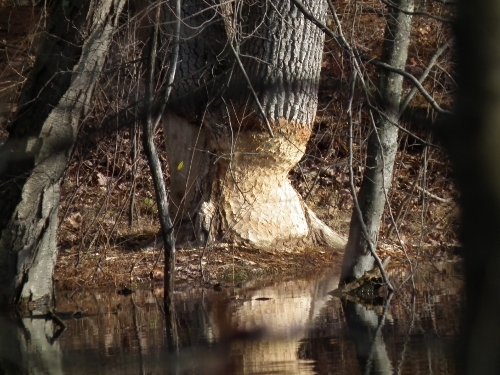 I don’t have the skinny on the beavers yet, but there seem to be many of them and, some worry, too many. 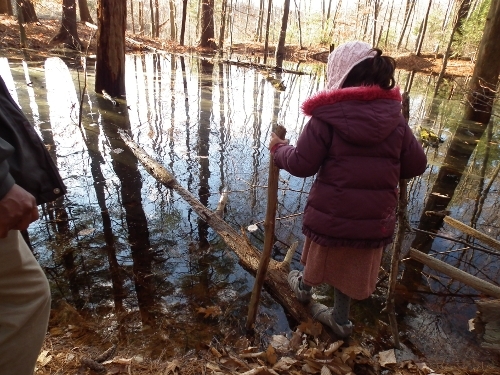 They have dammed the Pond so that now the water reaches higher, inundating old trails and making what used to be a vernal pool (first water body in the picture above) into a part of the “full-time” pond. We speculated that there must be some system or plan in their activities. Perhaps they are working up to a moment when they will tip one tree and it will take down all the others, like dominoes, in one great bang! Then they’ll have a party, say “our work is done here,” and move on. For the moment they’re at home. This is their lodge. No sign of the inhabitants. Seeing all this is so awesome to me, and I am eager to learn more about these animals. I’m also fascinated by the geology of the place, which is, like so much of New England, dominated by the 50,000-year-old glacier that started to retreat 15,000 to 16,000 years ago. I sometimes dream about that glacier. Today was about Amie. At first she didn’t want to come but the moment we arrived she started running and jumping, suddenly free and wild herself. 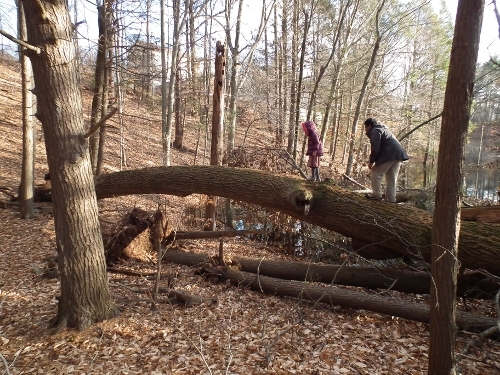 She had climbed onto this great downed oak before we knew it and DH had to scramble after her. She was upset at the end and I didn’t know why. She said she had “wanted to have more adventures and all we did was walk around and chat!” I will take her back after school some day and she can show me what it is that she wants to do. We can also take our journals and draw or write. We are reading the Finn Family Moomintroll which another friend gave her and perhaps she has that landscape in mind and the adventures of Moomin and his curious friends. I can certainly understand her. 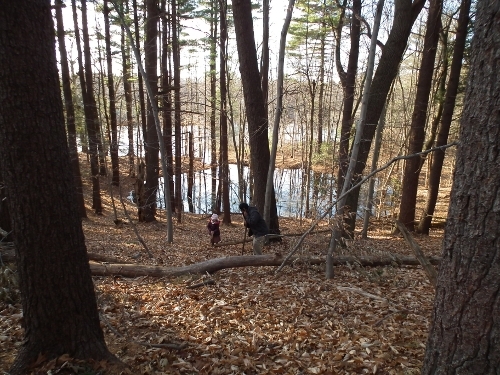 When I was a kid I was always pottering around in the overgrown area (now a nature reservation) across from my parents’ house, pretending to be the last kid left on Earth, losing my boots in the bog, coming home with leaves and mud in my hair. I would have gone on that tree too! I may still. love this post. Wanted to take my kids there last weekend but had trouble overcoming their homework and playdate time constrictions. But I do remember those days when I had more influence. What a fantastic post! I really appreciate you writing about Pod Meadow. 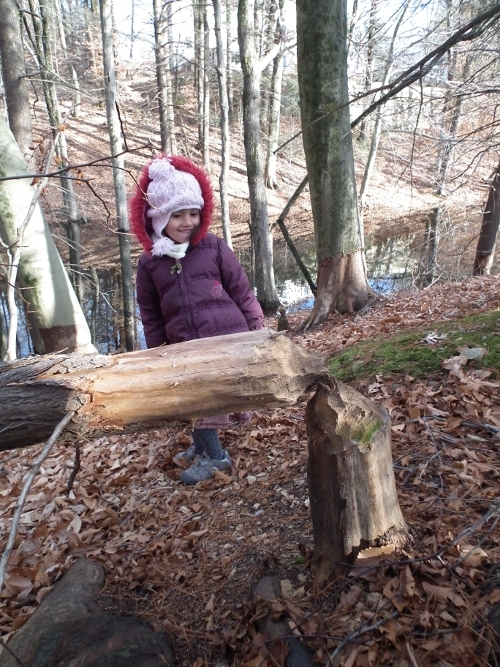 Kaat, I’m so glad that you and Annie had such a wonderful time at Pod Meadow. It really is a treasure of a place. I feel when I am there that I am far away from the busy world at the top of the hill.